The Fleming's of Baltimore is located in downtown Baltimore on Aliceanna and President streets. Here you'll find an exceptional menu inspired by a passion for steak and wine served with unrivaled hospitality. Join us after work and try our specialty cocktails or select from our list of 100 wines by the glass. Then stay to enjoy the finest selection of USDA Prime steaks, including our new Dry-Aged Prime Ribeye. 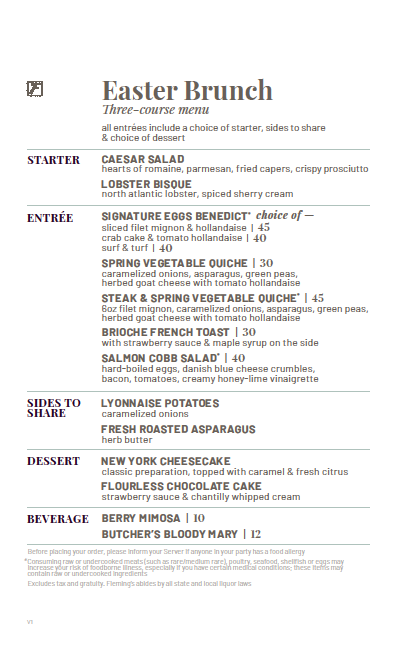 Click below to view our Easter brunch menu! Burger & Wine Bar Promotion: Pair a Prime Burger with a 6oz pour of Paraduxx, Proprietary Red Napa Valley, 2015 for $25. Available exclusively at the bar area between 2/22/19 and 3/12/19. Mondays at Fleming's: 3 Course Filet & Lobster Tail Offering for Just $50, and 3 Course Filet & Crab Leg Offering for Just $59. Mondays at Fleming’s: 3 Course Filet & Lobster Tail Offering for Just $50, and 3 Course Filet & Crab Leg Offering for Just $59. Three course, prix fixe dinner for two menu featuring our 35oz Prime Tomahawk. Two salads, our 35 oz Prime Tomahawk, two sides and two desserts for $120. Book a Private Dining event between 4/1/19 and 6/30/19 and the host will receive a $50 dining card for every $500 spent. (Contract must be signed between 4/1/19 and 6/30/19 and event must take place on or before 6/30/19) Contact the Private Dining Director for details. Spring Gift Card Bonus: Guests will receive a $20 Bonus card for future use with every $100 in gift card purchases between 4/1/19 and 6/16/19.